The 1992 movie “Bob Roberts” offers an uncannily prescient, satirical look at a candidacy much like Donald Trump’s. I had seen this film before, but I couldn’t have known at the time that it would be the script for the Trump campaign. This time around, I was floored by the jaw-dropping parallels. The one big difference is that, in “Bob Roberts,” the media is openly disgusted by his campaign. They do chase around after him in a Trump-like frenzy, but they’re not fawning–more like ogling. Also, the folk songs that Roberts uses to promote his philosophy are hilarious. [Tim Robbins wrote them and performs them—straight-faced– as well.] 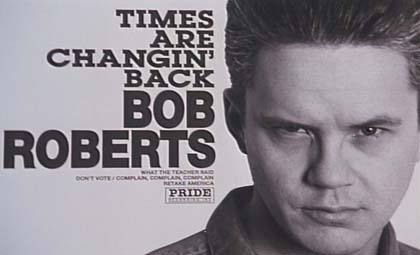 As Roberts, Tim Robbins does a right-wing version of Bob Dylan’s famous “Subterranean Homesick Blues” video, in which key words are hand-written on cue cards that he drops as the soundtrack plays. In another perverse homage to Dylan, he leads swaying, adoring fans and a church choir in an anthem called “ Times Are Changin’…Back.” He even steals from Woody Guthrie in a song called “This Land Was Made for ME.” It’s worth your while to listen closely to the lyrics of the Bob Roberts songs, and not simply dismiss them as soundtrack, background music. “Bob Roberts” didn’t get the attention it deserved when it was first released–probably because it seemed too wacky and improbable. Unfortunately, reality has now caught up with it.